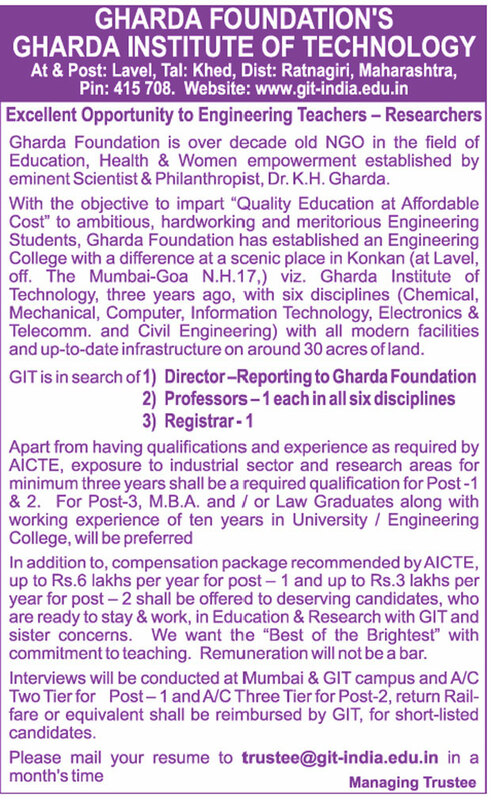 Excellent Opportunity to Engineering Teachers - Researchers Gharda Foundation is over decade old NGO in the field of Education, Health & Women empowerment established by eminent Scientists Philanthropist, Dr. K.H. Gharda. With the objective to impart "Quality Education at Affordable Cost" to ambitious, hardworking and meritorious Engineering Students, Gharda Foundation has established an Engineering College with a difference at a scenic place in Konkan (at Lavel, off. The Mumbai-Goa N.H.17.) viz. Gharda Institute of Technology, three years ago, with six disciplines (Chemical, Mechanical, Computer, Information Technology, Electronics & Telecomm. and Civil Engineering) with all modern facilities and up-to-date infrastructure on around 30 acres of land. In addition to, compensation package recommended by AICTE, up to Rs.6 lakhs per year for post - 1 and up to Rs.3 lakhs per year for post - 2 shall be offered to deserving candidates, who are ready to stay & work, in Education & Research with GIT and sister concerns. We want the "Best of the Brightest" with commitment to teaching. Remuneration will not be a bar. Interviews will be conducted at Mumbai & GIT campus and A/C Two Tier for Post -1 and A/C Three Tier for Post-2, return Rail- fare or equivalent shall be reimbursed by GIT, for short-listed candidates.